The discovery last year of a vast section of a spiral, star-forming arm at the Milky Way’s outskirts about 49,000 light-years from the galactic center, showed the galaxy to have a rare, beautiful symmetry — one half of the Milky Way essentially mirrors the other half. The discovery provides evidence for a large-scale coherent structure, spanning 60 degrees in the sky, which contains giant molecular gas clouds far from the galactic center that contain an amount of molecular hydrogen equivalent to that of 50,000 suns. The image above shows a region of the Milky Way displaying emission from molecular clouds located within the Galactic Ring. Previously identified as one of the most massive gravitational structures in the Milky Way, astronomers believe that this Galactic Ring is a signature feature of our home Galaxy: if alien civilizations from other galaxies were to peer down on the Milky Way, they would note the immense concentration of starforming molecular clouds located in donut-like distribution about the Galactic Center. The radius of this donut is estimated to be about 15,000 light-years, about half the distance between the Sun and Milky Way's center; it is also as thick as 3000 light-years in some places. 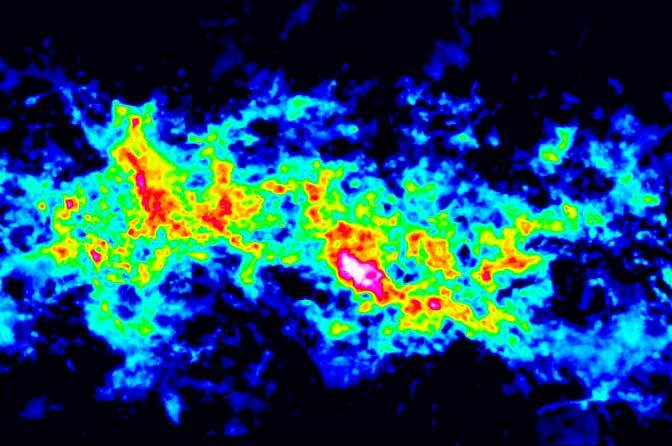 The concentration of molecular gas is spawning copious numbers of stars. An interesting result obtained from studying such active regions of star formation is that all of the molecular clouds studied so far have similar lumpy structures, regardless of their size, mass, and star-forming activity. These lumps will eventually become stars and, according to the researchers, this similarity suggests that all clouds form stars of various masses in roughly the same proportion. Thomas Dame and Patrick Thaddeus of the Harvard-Smithsonian Center for Astrophysics, said the structure they discovered in 2011 is most likely the outer extension of the Scutum-Centaurus arm from the inner galaxy. The finding suggests that Scutum-Centaurus arm wraps all the way around the Milky Way, making it a symmetric counterpart to the galaxy’s other major star-forming arm, Perseus. The two arms appear to extend from opposite ends of the galaxy’s central, bar-shaped cluster of stars, each winding around the galaxy. Dame found evidence for the new structure while reviewing galactic data on atomic hydrogen gas, which radiates at a radio wavelength of 21 centimeters. After tracing the extension of the arm in the 21-centimeter radio emission, “I was in the unique position of being able to walk up two flights of stairs to the roof of my building (at Harvard) and search for carbon monoxide emissions from molecular clouds using the Center for Astrophysics 1.2-meter radio telescope,” says Dame. Molecular gas clouds contain the raw material for making stars. 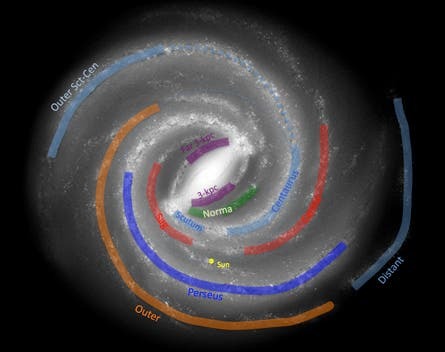 Virtually every spiral arm in the Milky Way has been found in sections, Dame notes. When astronomers realized that the Sagittarius arm, found in the northern sky, and the Carina Arm, in the south, were part of a single, larger structure, they became known as the Sagittarius-Carina Arm. Similarly, since Dame and Thaddeus believe the new arm is an extension of Scutum-Centaurus, “we suggested ‘Outer Scutum-Centaurus’ as a more logical name,” Dame says. The structure is longer than the known parts of the Scutum-Centaurus arm, he adds. The feature was previously overlooked because it tilts out of the plane of the galaxy, following the outer galaxy’s warp. Most studies examining spiral arms focus on the galaxy’s plane. Mapping all the carbon monoxide in the newfound feature will take several years. Nonetheless, the galactic symmetry revealed by the new observations, along with previous evidence, suggests that the Milky Way’s spiral structure is both simpler and easier to study than had long been assumed.